After attending a service at St. Nektarios Greek Orthodox Church, Jeff Maples of Pulpit & Pen made this observation: A lost person could not walk into this church and walk out a changed man. It was literally a Pagan practice. Like a seance. Pure witchcraft was going on in this place. One of the biggest complaints against Pulpit & Pen we get consistently is that we somehow don’t “have all our facts,” or are “misrepresenting” someone or something. I received countless emails claiming that I “misrepresented” Greek Orthodoxy in my recent posts regarding Hank Hanegraaff and that I should do more research. Well, what better way to research than to go straight to the source in person? 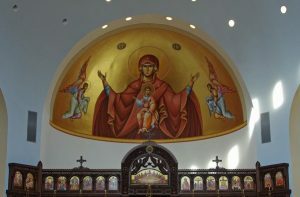 Saturday, April 15, known as Holy Saturday in the Orthodox tradition, I along with a couple of friends went to visit St. Nektarios Greek Orthodox Church in Charlotte, NC–the church that Hanegraaff was recently chrismated in. The service began at 11:30 pm, and was still going strong showing no signs of slowing down when we decided to leave at around 2:00 am. While we hoped to have the opportunity to confront Hanegraaff in person, being that we all had to get up early the next morning to worship the living God on Easter morning, we decided to call it a night early. However, there are quite a few things that we can take away from this experience in this church.